Well, that's it everybody! What a fantastic week, thanks to everyone who took part & contributed. We're already looking forward to next year! If you have any photos of the event you want to share, please upload them here. We'll go through them and start putting them up on the website soon. Zenoveva is one of our Travel Grant Receipients. We owe thanks to OSGeo for their financial support and advice which made the Travel Grant Program possible. How did you first become involved in the geospatial community? 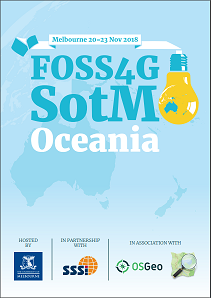 We're proud to share with you, at long last, our final, very shiny program for FOSS4G SotM Oceania 2018! Kim is one of our Travel Grant Receipients. We owe thanks to OSGeo for their financial support and advice which made the Travel Grant Program possible. I first got involved in R after going to a very technical talk. I had no idea what the code meant at the time but I was inspired enough to teach myself to code. That career change led me to exploring and using spatial packages in R.
Hirini is one of our Travel Grant Receipients. We owe thanks to OSGeo for their financial support and advice which made the Travel Grant Program possible. My work within the geospatial community is part of a growing interest by indigenous people worldwide to have more of a say in ways that their ancestral landscapes are mapped. It also stems from a tertiary education in archaeology where GIS is utilised heavily. Nimalika is one of our Travel Grant Receipients. We owe thanks to OSGeo for their financial support and advice which made the Travel Grant Program possible. Dorothy is one of our Travel Grant Receipients. We owe thanks to OSGeo for their financial support and advice which made the Travel Grant Program possible. Edwin is one of our Travel Grant Receipients. Stay tuned for our upcoming interviews with TGP recipients. It's the final countdown - 50 days remaining! After a comprehensive community vote and a rigorous selection process, it is our pleasure to announce a draft schedule for FOSS4G SotM Oceania. The schedule reflects the diverse skills and backgrounds of our community. We think you’ll be thrilled. Take a look at the line up of presentations here, and the draft schedule here. Tickets - time to act! The Free and Open Source Software for Geospatial (FOSS4G) and State of the Map (SotM) Conference Oceania is very privileged to have some fantastic support from sponsors, partners, and our ‘parent’ international organisations. We would like to recognise and thank all of those organisations for helping us make this event happen.